Location, Location, Location! Walk to Main Street from this Village Green 2 bedroom 2 bath condo. Spacious living area with gas fireplace, comfortable seating, and eat-in kitchen. Master bedroom with a queen and private bath. Guest bedroom with one queen, hall bath. AC. Village Green is a nice place to spend your summer vacation or enjoy the winter. Pretty landscaping with mature trees gives these units a private setting just minutes from shopping or dining out. NO SMOKING!! NO PETS!! This property has a ONE MONTH MINIMUM. Property maps may not be accurate on 3rd party web sites. Please contact the office directly for exact property locations. God experience. Noisy. Can hear street traffic and upstairs movement. We miss the view from higher up units. neat, clean and well appointed. 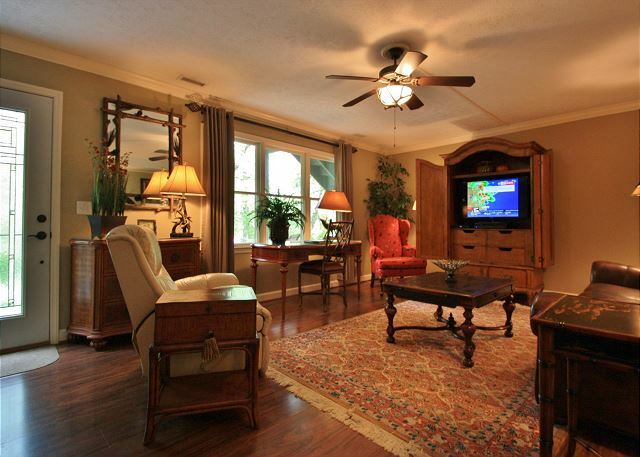 This condo is located in downtown Blowing Rock. It is in excellent condition with all of the kitchen items you will need. The rental company was very helpful and were prompt in helping me if I needed something to be repaired. I stayed there for the month of July and could have stayed all summer.